THE OCALA OFFICE IS LOCATED ON E SILVER SPRINGS BLVD. DRIVING DIRECTIONSARE FROM INTERSTATE 75 NORTH OR SOUTH TO HIGHWAY40/SILVER SPRINGS BLVD EXIT. GO EAST ON HIGHWAY 40/SILVER SPRINGS BLVD TO 933 E SILVER SPRINGS BLVD, LOCATION ON THE LEFT. FROM THE WEST, TAKE HIGHWAY 40/SILVER SPRINGS BLVD EAST TO 933 E. SILVER SPRINGS BLVD, LOCATION ON LEFT. FROM THE EAST, TAKE HIGHWAY 40/ SILVER SPRINGS BLVD WEST TO 933 E SILVER SPRINGS BLVD, LOCATION ON RIGHT. The Ocala Social Security office is located in Ocala 34470. The following page includes information for this location like the office phone number, hours of operation and driving directions. If you have any interests or comments about your retirement benefits or are interested in making an appointment, call the following Ocala Social Security office. The Ocala Social Security office is located in Ocala 34470. The following page includes information for this location like the office phone number, hours of operation and driving directions. 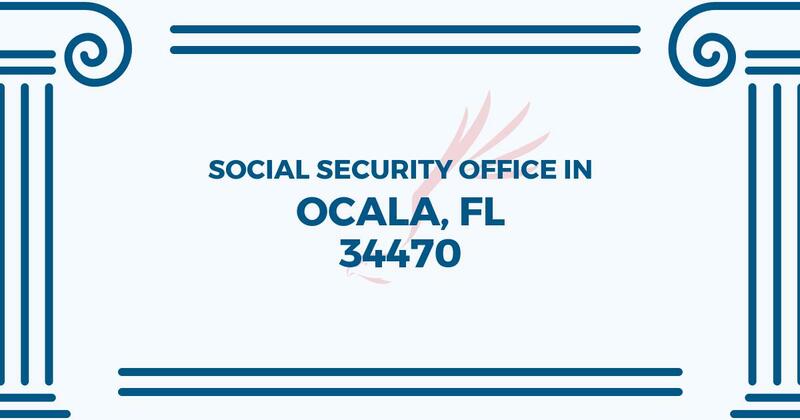 If you have any requests or worries about your retirement benefits or are interested in making an appointment, call the following Ocala Social Security office. We were very impressed with the friendliness and helpfulness of the two staff members assisting us with disability and retirement. They were great. I do suggest getting there early to get good parking and faster service. There was a line of about 20 people waiting for the doors to open when we got there a little after 8 a.m. Checked in at 9:03 after only standing in line maybe 5 minutes and was called about 9:15 and was out by 9:45. Very speedy process today. Most of the time we spent with the very patient, kind, and helpful associate. He went above and beyond to help expediting a speedy resolution to my check that was inadvertently sent to another state.